An Asian style main course, ready in 25 minutes. Preheat the grill to high. Put the shallots, garlic and lemon grass in a food processor and whiz until very finely chopped. Add the mint, coriander, cornflour, pork, fish sauce and some seasoning and pulse until well combined. Shape into 20 balls – wet your hands to stop the mixture sticking. Place the pork balls on a baking sheet lined with foil and grill for 3 minutes each side, turning once, until just cooked through. Spoon over the sweet chilli sauce and grill for another minute on each side, until lightly caramelised. 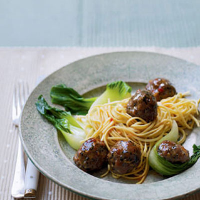 Serve with the noodles and pak choi, with an extra drizzle of sweet chilli sauce.